Vegan Quinoa Falafel Recipe - Eat. Drink. Shrink. Out of all the amazing vegan eats in the NYC, my ultimate fave quick bite is Mamouns Falafel in the West Village! I had it almost every day while studying at NYU, and enjoyed it even before I attended there. There is something about homemade falafel with all of the mediterranean flavors that I’m just crazy about! Ironically, a falafel recipe was the very first concept I ever produced for a client on Eat Drink Shrink! This was actually while finishing undergrad and before I even took a new culinary direction. While I had not revisited this recipe again and it featured coconut flour, I remember the flavor being simply divine! If there is one recipe you should have down pat with vegan cooking, it has to be a good falafel.. So I decided to create a new an improved version! What I love about this recipe is as I always say, everything! 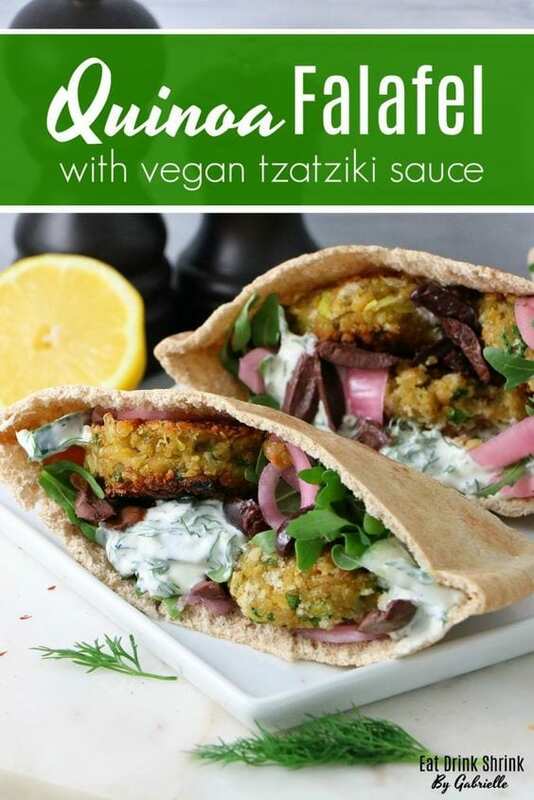 It’s quick, easy, cheap, can be baked, packs flavor, packs quinoa, protein, savory with a hint of mint, the tzatziki sauce can be used for countless other dishes, the pickled red onion adds a sour flavor dimension, can be made in bulk and frozen, and is non vegan approved! If you need that staple falafel recipe that can be baked of pan fried, you ned my recipe for this classic Quinoa Falafel! Add onions, garlic, and herbs to a food processor, blend until finely chipped. Add chickpeas, and pulse until coarsely chopped. Don’t overland and form a paste. In a large bowl, combine the chickpea mixture with cooked quinoa, cumin, cayenne, coriander and cardamom, garbanzo flour, baking powder, and lemon juice. Add salt and pepper as desired. If the mixture seems too wet, at more flour 1tbs at a time. You want them to hold together, but you also don't want them too dry. If you’re not working under time constraints let the mixture chill in the fridge for 1hour to firm up. Otherwise, begin to form small discs with the mixture. Dip in Panko and press the breadcrumbs into the patties. This will form a crispy outer layer, but is optional! Heat a large skillet over medium heat and add enough oil to generously coat the pan - about 2 Tbsp. Swirl to coat. Once the oil is hot, add only as many falafel as will fit very comfortably in the pan at a time - about 5. Cook for a total of 4-5 minutes, flipping when the underside is deep golden brown. Repeat until all falafel are browned - the deeper golden brown they are, the crispier they'll be. Dill Sauce: Throw everything in a bowl and combine. Serve falafels warm inside pita bread and garnish with dill sauce, arugula, pickled red onion, and olives!